Duck Commander Ramblings And GIVEAWAY! First off, I just want to say thank you to everyone for all your congratulations on our fourth baby! I have been looking forward so much to this week, because I think you all are such a fun group of people to share our happy news with! Thank you for your sweet words and excitement for us, they add even more to our joy about our new little one! I am going to be working on a bump picture catch-up post to share with you all next week, but for the end of this week I wanted to share a new kid's devotional that we received! First off, can I hear from the Duck Commander fans? I admit, I was a little late to join the Duck Dynasty boat a few years ago. I didn't know what everyone was talking about, but from what I gathered it was an eccentric, duck-hunting family in the south that could be amusing. I wasn't sure what all the hype was about. Once I started watching though, I loved it right away! Sure, the Robertsons can be eccentric (how many people do you actually know who eat frog legs? ), but what I loved most about them is their love for Jesus that shines through everything they do. I also grew up in hunting family - we didn't hunt ducks, but we hunted many types of big game, so I can relate to the hunting culture. I've read a couple books by members of the Robertson Clan, but I was pretty excited when I saw that Korie Robertson has come out with a devotional book for kids! Each devotion has a cute story from the Robertson family archives, with a Bible verse and lesson attached to it. The illustrations are also fun, with cartoons of the Robertsons dispersed throughout the book (particularly Willie). We have only read a few devotionals so far, but I have loved the ones we have read! I think this will be such a great devotional to grow with the kids, especially the boys, and it will be fun to watch the TV show together more as an adjunct so Wyatt can remember some of the "characters". Tommy Nelson has offered to give one of my readers a copy of this devotion for free! Enter to win below! Note: I received a copy of this book for free from Tommy Nelson in exchange for this review. This is my honest opinion. I am having a hard time believing I am writing this right now. When I found out, I was in shock for a little while. I can't believe we have another surprise baby on our hands, and I am so excited to meet this new little life! As a little background, since Clyde was born Derek and I have been talking about whether to try for one more baby or not. We weren't sure, so we agreed to wait until Clyde turned a year old and talk about it then. Right before Derek started his new job, I started working out again, after months of procrastinating. I did Jillian Michael's 30 Day Shred for the first time in a long time, and I was feeling it, especially (so I thought) in my abs. My whole lower stomach area was really sore a couple days after my workout. I just attributed it to the Shred, until Derek made a comment later about it - and then it occurred to me that I might possibly be so sore because I was ovulating. The next day my soreness was completely gone, which made me wonder. I took my temperature the next morning, and it was definitely high - so I knew that I probably did ovulate. But I didn't think much more about it until a couple days later, when my chest started hurting a little bit. My chest never hurts as part of my pre-menstrual symptoms - I only ever get that symptom when I'm pregnant. I knew there was a chance I could be pregnant, because our preventative method might have failed, but I thought it was unlikely. Surely symptoms wouldn't actually start that soon, right? It had only been about 3 days since I ovulated. But my chest kept hurting, I had to use the restroom more often, I felt tired, I felt emotional, I was dying for some chocolate peanut-butter ice cream. I felt pregnant. I bought a few pregnancy tests, and I took one at 9 days past ovulation, because the test supposedly could give a result that early. But it was negative, so I decided to try again in a couple days. I decided to take another test on11 dpo, and I was convinced that I was going to get a positive. I really felt pregnant, and even though I was trying to remain neutral, I hadn't been able to help thinking in terms of four kids for the past week. I looked at the two types of tests I had. 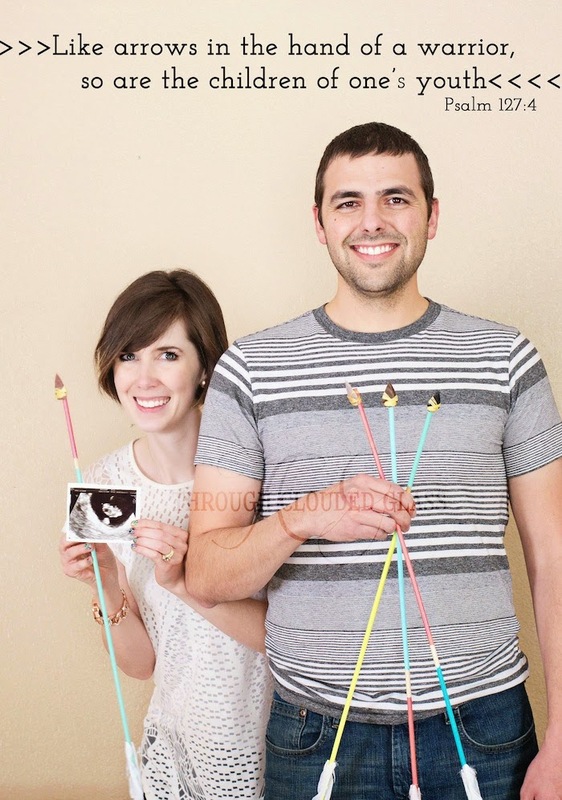 One would be about 53% accurate at 11dpo, and the digital one would be 87% accurate at 11 dpo. I was hoping to save my digital test, but I figured more accurate was better, so I took it. And I sat there and waited and prayed while I watched the little clock icon blinking at me. And I finally looked down and saw the word "No-". I felt a surge of disappointment. I tried to take the test at face value, because 87% chance of being accurate seemed pretty good to me. I couldn't believe I had fooled myself into thinking I was pregnant when maybe I wasn't after all. It was a MOPS morning, so I got the kids up and dressed, and headed out. We stopped at the grocery store for some breakfast, and I bought another set of pregnancy tests - that other 13% kept running through my mind, and I knew I'd want to take another one in a couple days, just in case. I bought myself a Venti coffee at Starbucks, because if I wasn't pregnant I might as well enjoy my caffeine. I settled in my chair at MOPS, and I let Wyatt stay with me since he kept insisting "I want to sit wit yoooou today, Mama". We ate breakfast, and then listened to one of our mentor moms give a devotion. I looked at the 1/3 of a Venti that I had left, and suddenly that coffee seemed like a really stupid idea. What if I really was pregnant? I ended up throwing the rest away. For the craft that day, we made a bird nest necklace, with wire and beads. Typically you make a necklace with the same number of beads as kids that you have. I stared at the bowl of beads and debated about how many beads to take. I took four and tried to hide them from my group, until I realized that a few other people added more beads than kids too. I told myself one of the beads could be for Derek, but I knew if I wasn't pregnant I would never wear that necklace. It just felt wrong not to include four beads. On the drive home my mind was running a hundred miles an hour. What if I was pregnant? I should probably take a test the next day so I could properly shield myself while taking x-rays at work. I felt on the verge of crying all the way home, and I was having a hard time convincing myself that all my symptoms were due to PMS. The last five minutes on the drive home I started feeling really anxious. I'm not even sure why, but my stomach hurt. I felt like I couldn't breath. I was shaky. I was wondering if maybe it was partially because of the caffeine, and it was affecting me differently because I was pregnant. I have never felt so weird before, and I tried to take deep breaths. I parked at home and slowly gathered my things together to bring inside before I got the kids out, but I just felt weird. I looked down at the grocery bags, and I saw those pregnancy tests I had bought. And suddenly I knew I had to take one now, even though it was the middle of the day. I told the kids I would be right back to get them, rushed in the house, and headed straight to the bathroom. I glanced at the pamphlet and saw that these would be 96% accurate at 11 dpo. I took the test, and sat there and stared at it while it developed. And very slowly, a faint second line appeared. I burst into tears, because I was so happy, and also a little scared. I was shaking still, but I brought all the kids in, fed them lunch, and got them down for a nap. Then I sat on the couch in shock for a couple hours. I just couldn't believe I was pregnant! Waiting all afternoon until Derek got off work was torturous - I was making myself sick with the waiting, and trying to decide how to tell him. I decided to just tell him on the phone, instead of waiting until he got home, because I was still feeling anxious and shaky and weird. I couldn't wait that long to tell him! I knew he wasn't expecting this at all. I tried to call him several times but I just kept getting voicemail, then finally he called me back. I asked him how his day was, then told him "I'm pregnant", and immediately burst into tears again (thank you, pregnancy hormones). He said "Well, I guess we're having four kids! ", and after the initial shock wore off he told me he thought this would be a really good thing! He has been so excited about our little peanut ever since! Derek really wanted to tell his mom right away, so I called my mom and dad too. I sent my mom a text with a picture of the necklace I had made that day. I told her I wanted to show her this necklace I made, and I said there was a bead for each of my kids. "Oh, that's so cool, honey!" she said. "What's the fourth bead for?" "There is a bead for each of my kids." "Are you trying to tell me something?" Then I told her and burst out crying again (are you noticing a pattern?). She was excited for us, and put my dad on the phone so I could tell him. He joked "What are you doing to me - I'm going to have to buy a bus!". I got the kids in bed, Derek finally got home, and he brought Qdoba for dinner. He gave me a hug, and we talked, and ate dinner in bed while we watched "The Celebrity Apprentice". It felt like the perfect way to celebrate. We had an ultrasound on February 16th, and it worked out perfectly because Derek had President's Day off! We got to see our little jelly bean for the first time. I was looking for that heart fluttering on the ultrasound screen, but the ultrasound tech moved around so fast that she had me worried. But then I saw that little flicker! What an amazing feeling that is, to see your precious little baby's heart beating. The heart rate was 163 bpm for those of you who want to start gathering evidence for your gender guess! My due date is September 27th, and it just amazes me how the Lord made the decision about a fourth baby before we had to! I am so glad He did, and I could not be more thrilled - I always wanted four, and the Lord decided to grant that desire of my heart! This baby was planned by Him, and He orchestrated everything in His perfect timing to bring this little one into existence. My plan is to keep this pregnancy as low-stress as possible and just enjoy every minute of it, since this baby will probably be my last one. Shortly after I took my test that day, I feel like the Lord reminded me about my word for the year - simplify. I want to keep things simple this pregnancy and just soak up every little milestone, every little kick. I keep thinking about who this new little life will be, and I feel like the most blessed girl in the world! We are so excited and happy about our fourth precious gift! 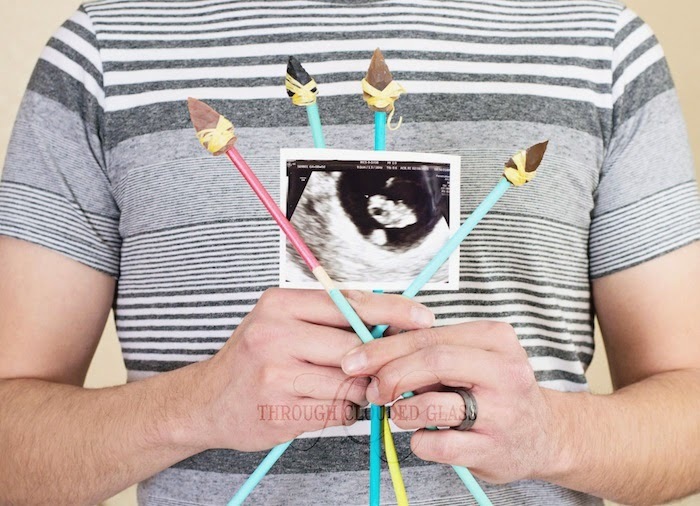 We are adding one more little arrow to our quiver! Baby #4 coming September 2015! Hey guys! Well, the last couple weeks have been weird to say the least. 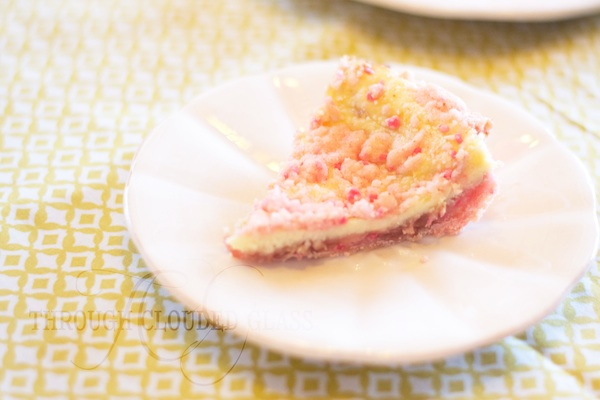 Just lots of unexpected things that are totally throwing my blogging schedule. Normally I would have some nice accompanying post, but today I have nothing, so I'm just going to point you over to my post on Tommy Nelson today! 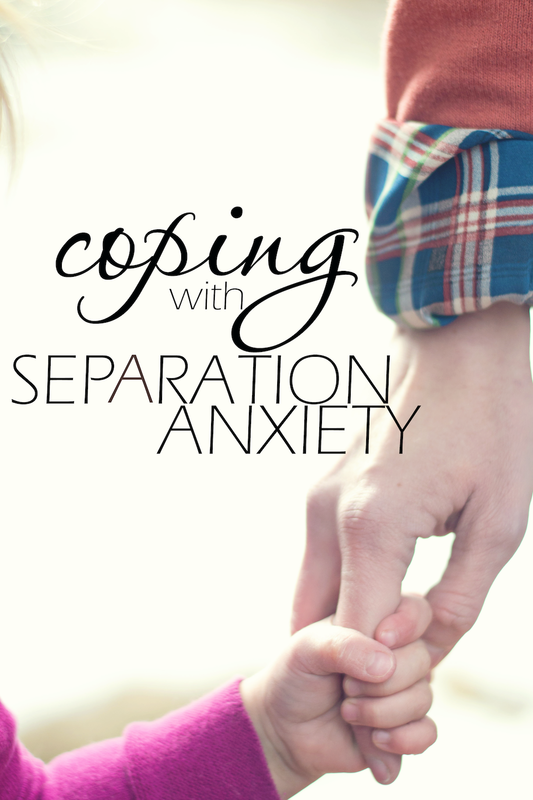 I wrote about separation anxiety, which I feel is ironic, because I would not consider myself an expert at handling it - however, we have found ways to cope. And when I say we, I am not just talking about the kids, I am including myself! 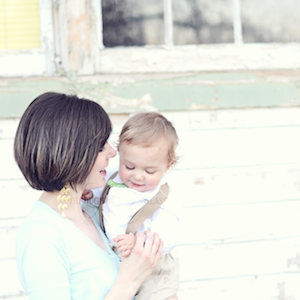 I hope I am not the only mom who gets anxious for her kids sometimes. A verse that my mom taught us in childhood reminds me that I need to point my kids to the One who will always be with them if they put their trust in Him. And sometimes I need that reminder too! To read all about my separation anxiety story and verse, head on over to Tommy Nelson's blog! My sweet Clyde is 10 months old! I just had a weird moment where I forgot how we got here. Didn't he just turn six months? There is no way he is 10 months, right? Maybe I should recount. Mr. Clyde is just so much fun! He has the cutest little personality, and I can't believe how much his looks have changed over the last couple months. He has four teeth now, and I suspect he is working on more! He has the cutest little gap between his upper two front teeth, just like Gwen's, and it is adorable. His hair is growing longer, and even though I should probably cut it, I can't bear to yet because I love the little curls above his ears. His favorite "word" is "a-dat". He says it for everything that he doesn't know the name for. I still cannot get him to say "mama"! Which is ironic, since I know he loves me. I am convinced that sometimes he wakes up in the night just because he misses me. He has become an expert scooter, and he wiggles his way all over the house. He gets around really well, and even though I'm not sure what day it actually happened, he has figured out how to pull up onto his knees. He is perfectly content crawling around, as long as he sees other people around him - he hates being alone. If he can't see me or the kids, he gets upset. He was happy as a clam crawling around on the floor at Wyatt's birthday gathering a couple weeks ago, just because there were people everywhere. He still scrunches his nose when he is especially happy, and he loves his bottle. If he sees it and he can't reach it, he will cry until you give it to him. Sometimes he doesn't even drink out of it, he just chews on it. He is shaping up to be a blanky kid too, just like his brother and sister. He loves his soft blanket, and he has started to want it before he goes to sleep. He was upset before bed the other night, until I gave him his blanket - then he grabbed it, snuggled it up to his face, closed his eyes, and grinned. He has the cutest little face when he is scared or nervous - it is like a cross between a smile and a grimace, with his little neck muscles tensed, and you can see that he can't decide whether to laugh or cry. Usually we coax him to laugh, because that little face is so cute that Derek and I can't help but laugh! That sounds so mean, but you just have to see his face - it is so cute. Lately if he sees Derek or me, or gets excited, he does this heavy, excited breathing, like a pant. It is so cute and hilarious! It makes us chuckle every time. The other day he gave me a real, honest-to-goodness, on-purpose kiss! I was sitting with him on the couch and I gave him a kiss - then he smiled, pressed his mouth against my cheek, and said "MMMAA"! He has given me baby "kisses" before, but this was the first one that he made the noise, and I had no doubt that it was an intentional kiss. He has done it a couple times since then, and I love it so much! If I had to describe the last month with you, I would just say it has been so fun! You have always been a happy baby, but now that you can move around more on your own, you are more content. You love exploring, and I love watching you develop your curiosity. Your two front teeth have really come in, and I just love that little gap-tooth baby grin! Your little belly laugh is one of my favorite sounds. I feel so blessed to be your mama, sweet boy, and it is so fun watching you grow and even learn to communicate things more. I can't wait for the day when I hear you say "mama"! I love you more than all the pine needles on all the evergreen trees in the world. "Remember The Lilies" by Liz Tolsma is a story set in Santo Tomas, a prison camp in the Philippines during World War II. Many Americans find themselves in this Japanese prison camp, including Irene Reynolds, a woman who grew up with her missionary aunt int he jungle after her parents abandoned her, and Rand Sterling, a nightclub owner who dreams about returning to his easy pre-war life. Irene and Rand meet when Irene tries to deliver a confidential message to Rand just as he is attempting a dangerous escape from the camp. Plans foiled, Rand and Irene find themselves thrown together more and more, and an unlikely romance blooms. I thought the characters in this story were sweet, and I liked their simple romance, which was a little complicated but not so complicated that it makes you cringe. I felt like I would have liked some of the characters to have a little more depth, particularly a couple of the secondary characters, but I thought they were all likable. I thought the author did a fantastic job of weaving spiritual lessons into this story without it seeming unnatural. Maybe part of it was the setting of the book, because when put through such hard experiences, I think it is common for people to think more about spiritual things. I especially liked how she wove the gospel into this story. I think it takes skill to make a fictional conversion seem natural, and she did it well. This story was a sweet romance, amidst conditions that were not ideal - sickness, starvation, and poor treatment by the Japanese in the prison camp. I have not researched prison camps during World War II, but the author seemed to have done her research thoroughly, and I thought this book gave a glimpse into what life must have been life for those who found themselves in one of these camps. Conditions continued to worsen throughout the story, and I thought the author ended the story very well. Note: I received a copy of this book for free from Litfuse Publicity Group in exchange for this review. This is my honest opinion. You also have two more days to enter the Kindle Fire giveaway as part of the "Remember the Lilies blog tour! Check it out! Last weekend we had Wyatt's 4th birthday party! I should clarify that this was less of a "party", and more of a family gathering. I just like doing themes for the kids' birthdays for fun. When I asked Wyatt what he wanted to do for his party this year, he said he wanted a race car party, so that is what we did! 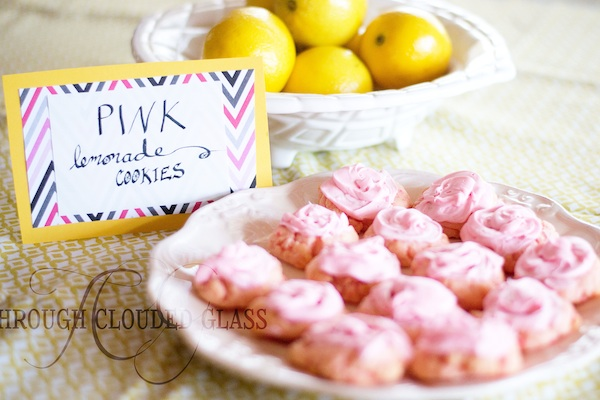 Everything was pretty easy to throw together for this party. 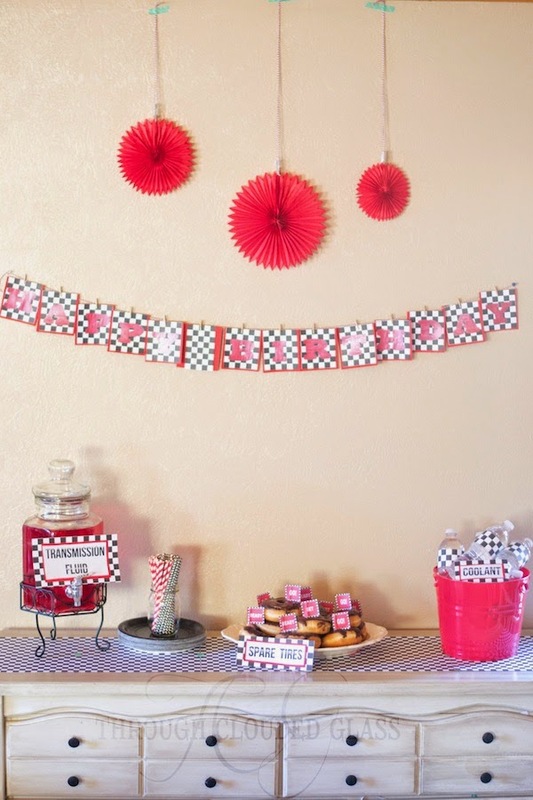 I bought some checked and red paper and used it to make the birthday banner and signs. 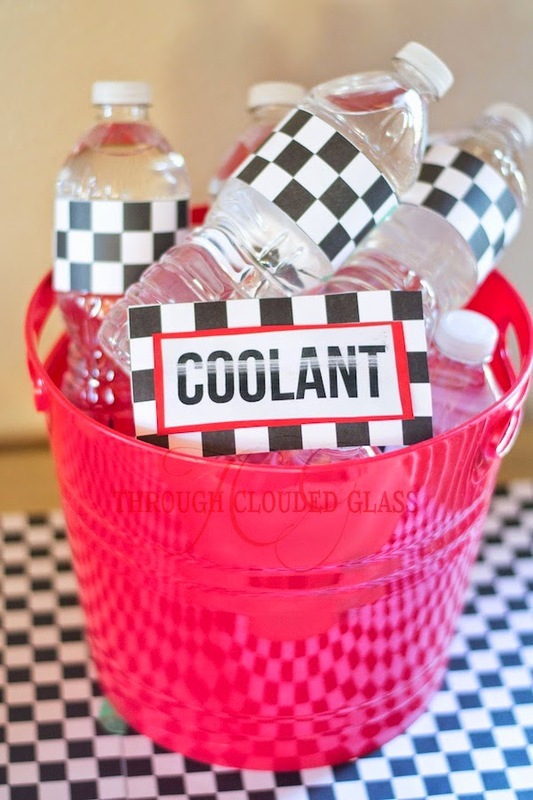 I also wrapped some of the checked paper around the "coolant" water bottles, and used the extra paper for a runner on our "pit stop" table. 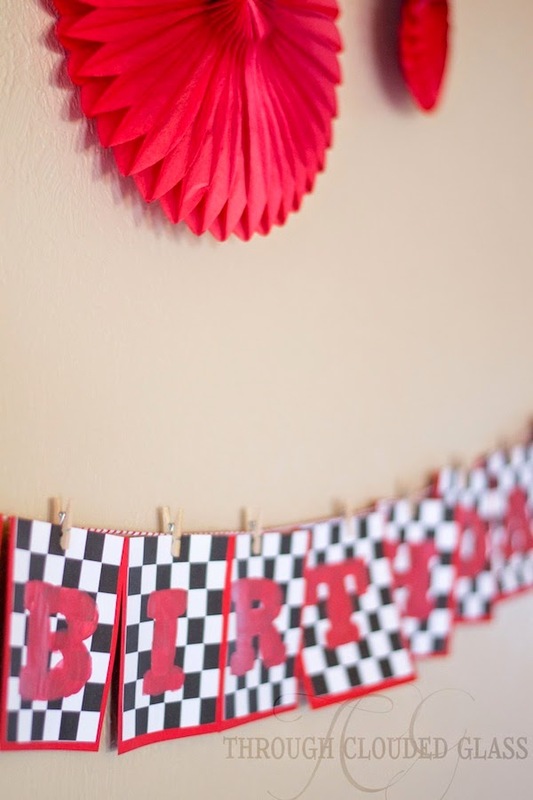 I added red streamers and black and white balloons to fit with our race car color scheme. Bought some "spare tire" chocolate donuts, and some red Kool-aid for the "transmission fluid" (which is actually red in real life too). 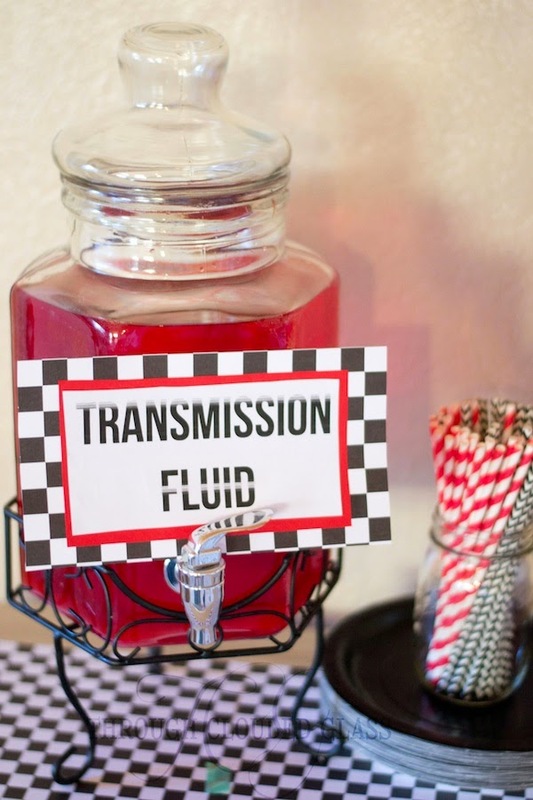 I originally wasn't going to label everything, but I asked Derek what car fluid was red, and he talked me into making the labels last minute - and I think they ended up tying the theme together really well! 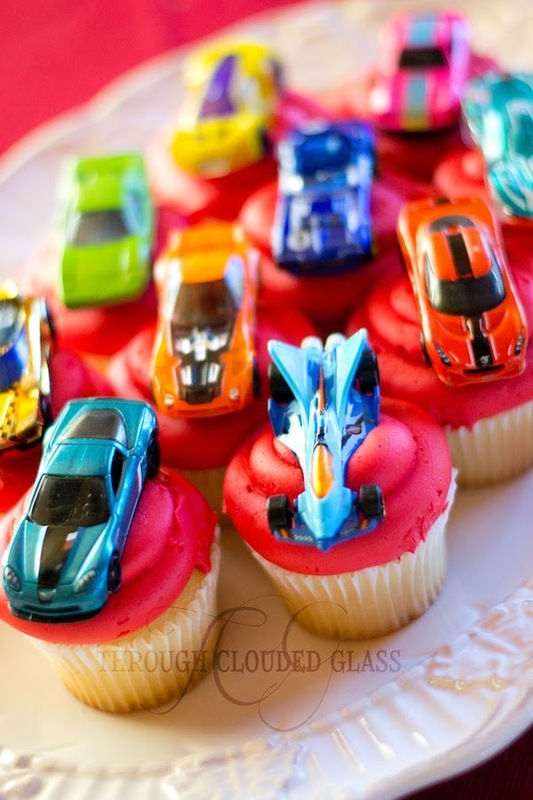 I washed some of Wyatt's Hot Wheels cars and put them on top of some red cupcakes. 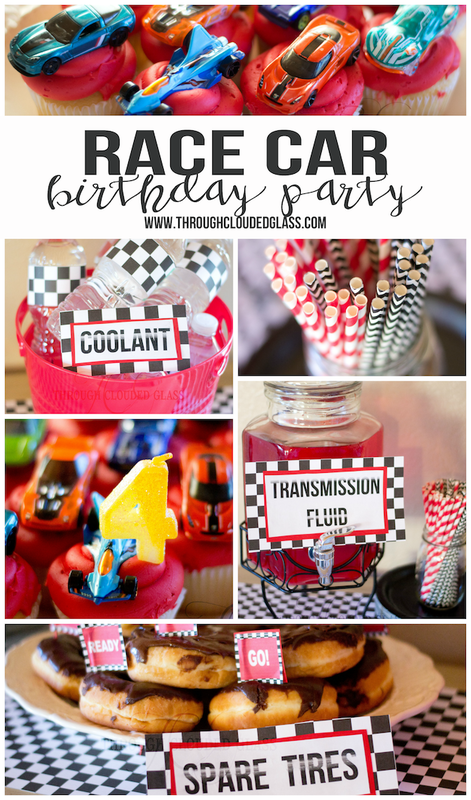 If you bought some new Hot Wheels cars this would be a fun way to give out favors to the kids who come to the party too! And that was it! 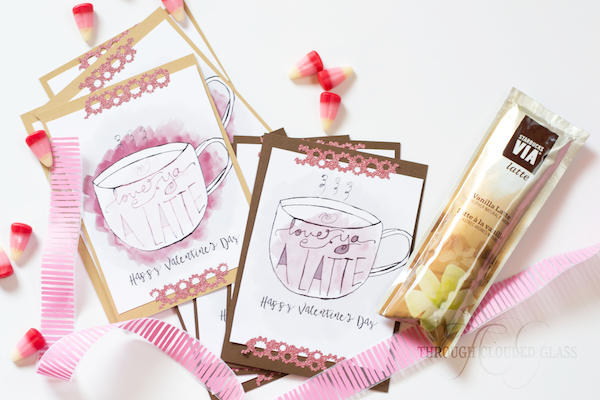 It was a really simple theme to put together, and we had fun with it! For more pictures of Wyatt at his party, you can check my family photo blog, or sign up for my newsletter and I will send out the link! I can't believe it, but my first baby turned four years old yesterday! I can't believe how much Wyatt has changed - in just language skills alone I can't believe how much he has grown in just a year. Wyatt has a really laid-back personality He is cautious, and likes to be sure of a situation before he jumps in. He is a very obedient boy, and typically does really well at listening to me, which makes my life so much easier! He has such a sweet heart, and I love how he shows concern for others when they are hurt or upset. He is always checking on me and his siblings, and if he sees me upset about something he comes over and asks me what is wrong. He is also shaping up to be a really good friend, even in his little toddler friendships. He is an amazing big brother, and he is so helpful to me in keeping an eye on Gwendolyn and Clyde. He loves hanging out with his extended family, and is always talking about his grandparents, aunts and uncles, and cousins. He follows Derek around and copies everything he does - I can hear Derek in the way Wyatt speaks sometimes. He is very into cars, and Thomas the Train, and balloons are some of his favorite things. He insists that he isn't a little kid, he's a "big boy." He loves games, and is always asking me if we can play one of his board games! He has a good little memory, and we have been working on several Bible verses, which he can say all by himself. He loves to pray by himself, and if he has a bad dream or is scared of the wind, he reminds himself that "Jesus is wif us." I wanted to try to do a little birthday interview with him this year, and I think he was a bit confused at why I was firing questions at him when he was just trying to play with his toy boats in the sink - but he humored me! I asked him these questions yesterday, before we opened presents. Here are his answers. What is your favorite color? "Purple." What is your favorite food? "Um, quesadilla!" What is your favorite movie? "The car movie." Who do you like to do things with? "Mommy and Daddy. . . (and more about police cars)." What do you like to do with Mommy and Daddy? "Uh, hang out with them!" What is your favorite animal? "My favorite animal? An elephant, and a giraffe, and a tiger, and a lion." What is your favorite thing to wear? "I think a hat?" (After some clarification) "Lightning McQueen or Thomas the Train shoes!" More photos of Wyatt on my photo blog, or if you are subscribed to my newsletter I will send out a link in the next one! 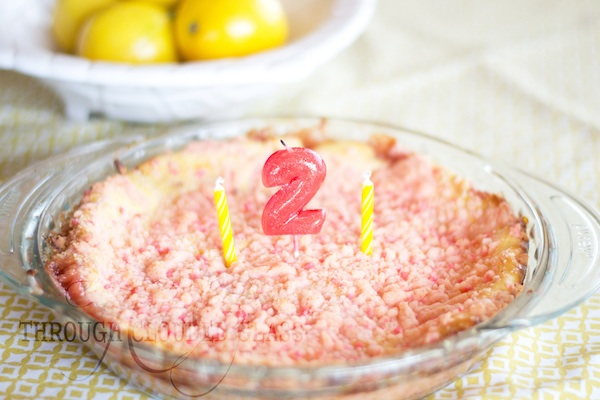 I am finally getting around to posting about Gwen's 2nd birthday party! I am determined to always make a big deal of Derek and Gwen's birthday, since it falls right after Christmas. It's hard having a Christmastime birthday because people tend to forget with the busyness of the holidays. We didn't have a "party" for Gwen this year, per se - we just had some of our immediate family over for cake, and to give her presents. Still, I see no reason why I can't have a birthday theme anyway! 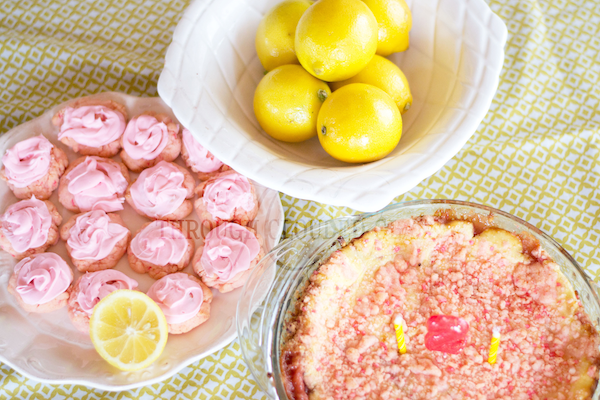 This year I had a couple packages of pink lemonade cookie mix in my cupboards, so I decided to go with a Pink Lemonade theme. 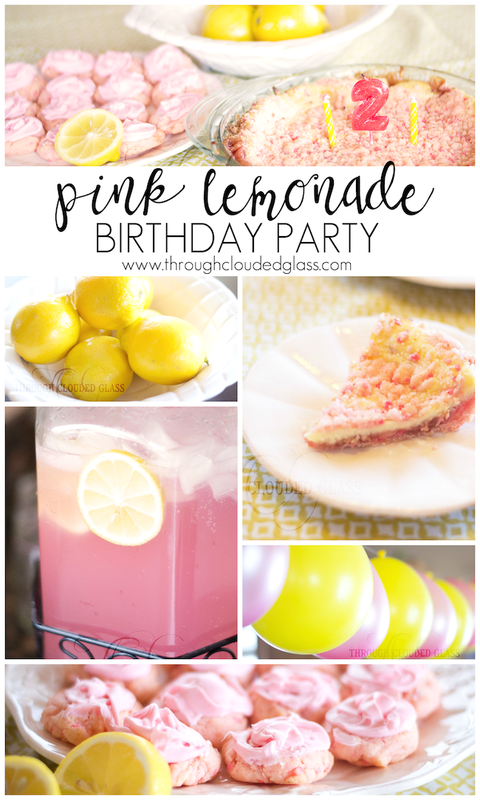 It turned out really cute, and I think this was one of the easiest parties I've done! 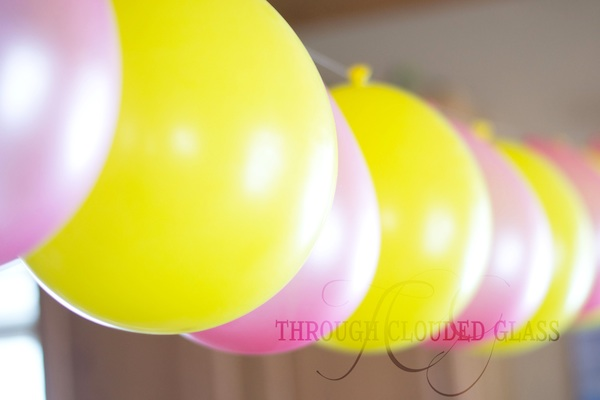 For the party I just got some yellow and pink balloons and streamers. 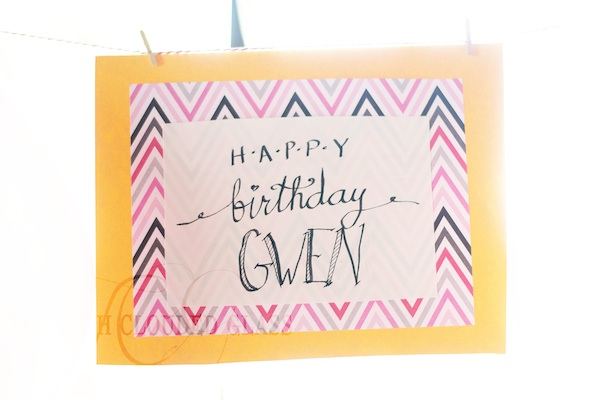 I used some old scrapbook paper and made a few labels and a birthday sign for Gwen. 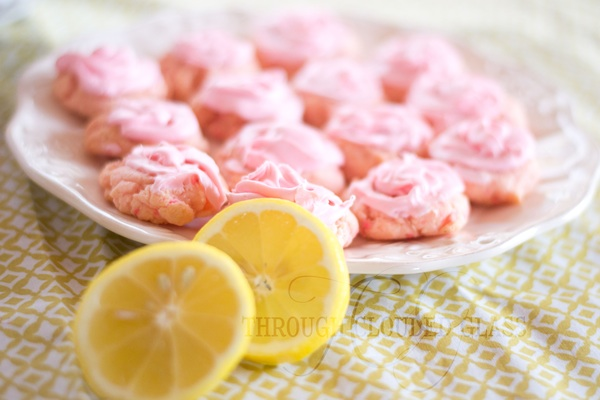 I made pink lemonade cookies from a mix, and I used the same mix to make a pink lemonade cheesecake - which was so good! 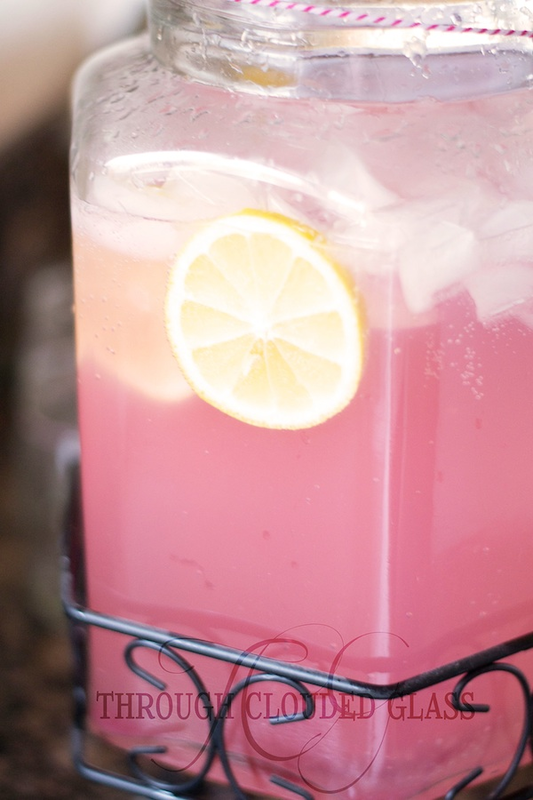 I wish I knew how to replicate it without a mix. 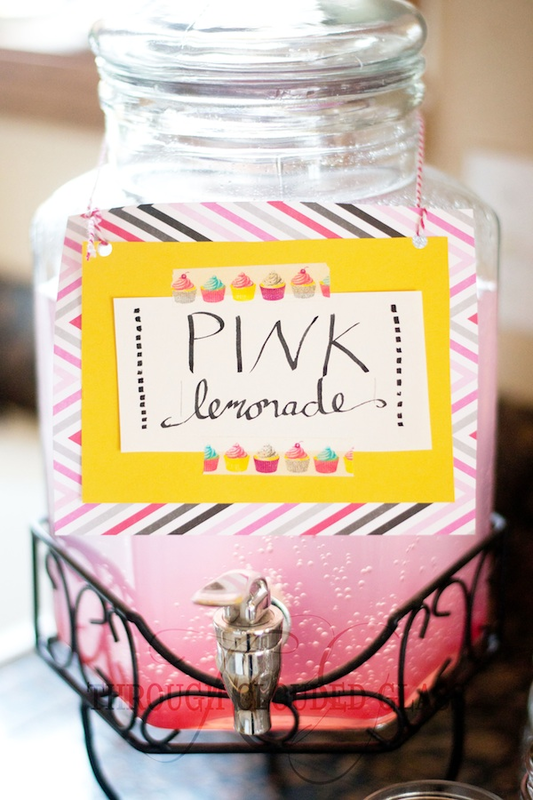 Of course we also had to have pink lemonade. 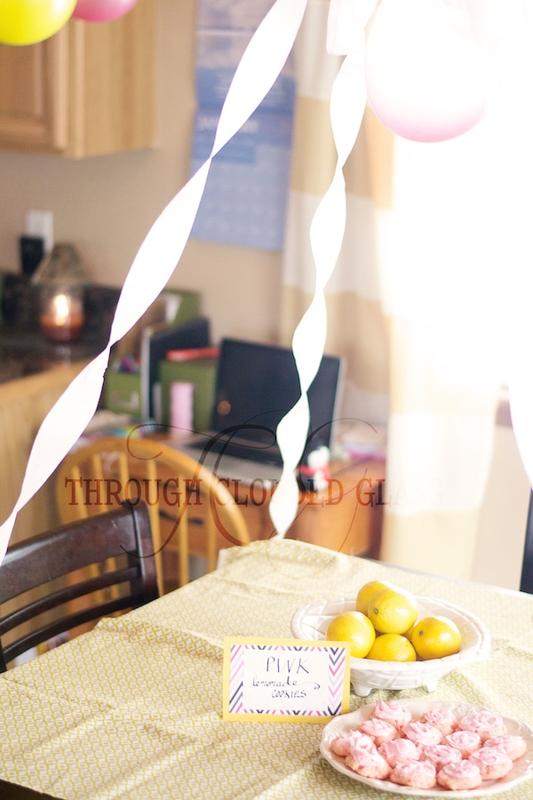 I put a yellow tablecloth on the table, and got some lemons to add to the decor. 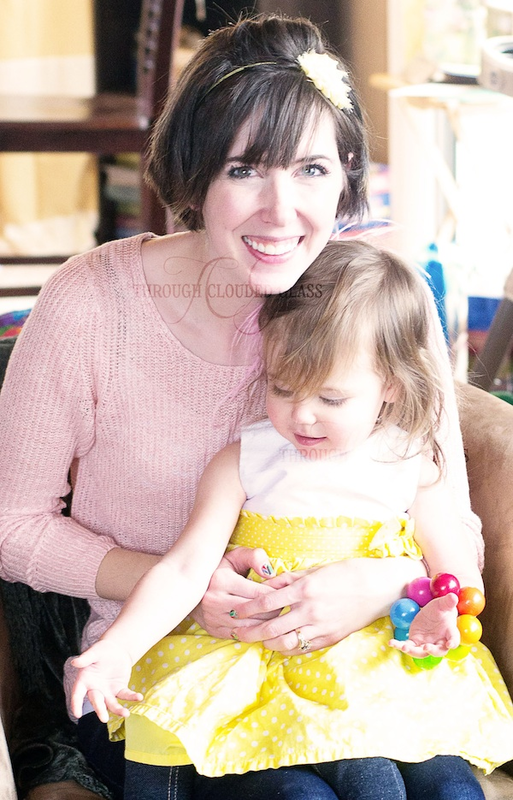 Gwen and I got all dressed up in pink and yellow! I just happened to have the perfect yellow dress and pink hair bow for Gwen's birthday outfit. I told you, everything just came together! 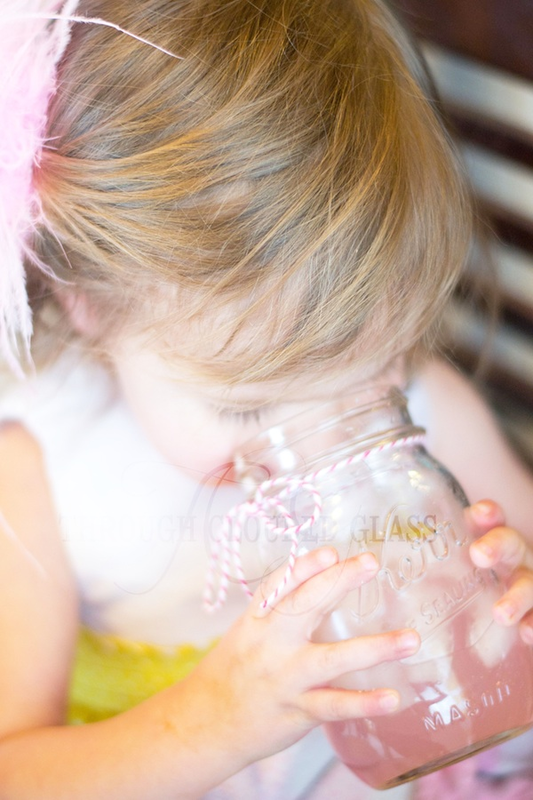 For those of you follow my photo blog, head on over there to see more pictures of Miss G at her birthday party! She is pretty adorable. I'll send out a link in my next newsletter as well! One of my favorite book series of all time is Anne Of Green Gables. And I just finished watching Gilmore Girls. I think the parts that I like best about both of those series is the small town feel to the stories. Even though there are main characters, like Anne, or Lorelei and Rory, all the other characters in their small towns are woven throughout the story. It makes it richer, and more like real life. It irks me when a book only focuses on one or two characters in isolation, because that isn't how most people live their lives, especially in small towns. There are lots of people in the day-to-day that enrich our lives. You know their quirks and charms, and even though you may not know some of them well, or you may know some of them well enough that they drive you crazy, you love them all anyway for the charms. If I was to pick one word to describe House Of Living Stones by Katie Schuermann, it would be charming. It really was like Anne of Green Gables, meets Gilmore Girls, meets church. House Of Living Stones follows the story of how Zion Lutheran Church got their new choir director, Emily Duke, and it follows along with the quirky politics and relationship dynamics of the people in that church. 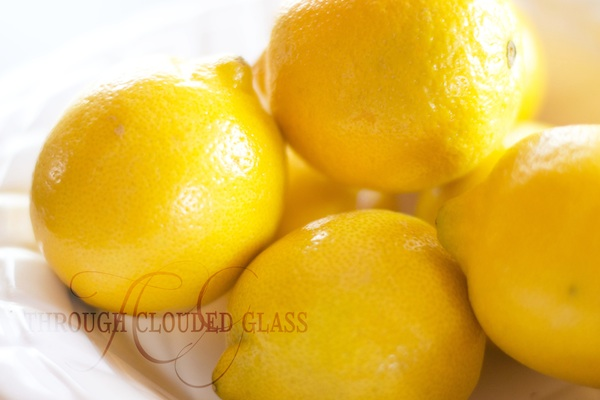 The book started out slow, but by the sixth chapter I was really interested in the story. There really were several stories going on at any one time, but they were all woven together seamlessly. The characters were lovable, sometimes frustrating, but many times heartwarming. There were several "mysteries" about the pasts of some of the people that were revealed throughout the book, but in a real-life sort of way. There was also a subtle love story that did remind me of the one between Gilbert and Anne. In spite of that though, I thoroughly enjoyed this book, and if you like Anne of Green Gables or Gilmore Girls, I would say that once you get into this book, it has the same feel to it. Note: I received this book for free from NetGalley in exchange for this review. This is my honest opinion. I know to a lot of people it is just a Hallmark holiday, a holiday companies make up to encourage us to spend more money and buy more cards. But I like the idea of showing the people in your life that you love them - our husbands, but also our kids, our family, and our friends! Valentine's Day was always a family affair for us growing up - Mom and Dad went on their date, but every year they would have some sort of surprise for us too. Sometimes it was candy, sometimes it was stuffed animals, once it was even a new Adventures In Oddyssey set! But I love that they did that. I think it would have been easy to become depressed about having no romantic prospects every Valentine's Day since I didn't have a boyfriend (Derek) until I was 18, but my parent's gifts made Valentine's Day something fun. I want to do that for my kids, and for the other people in my life that are important to me. 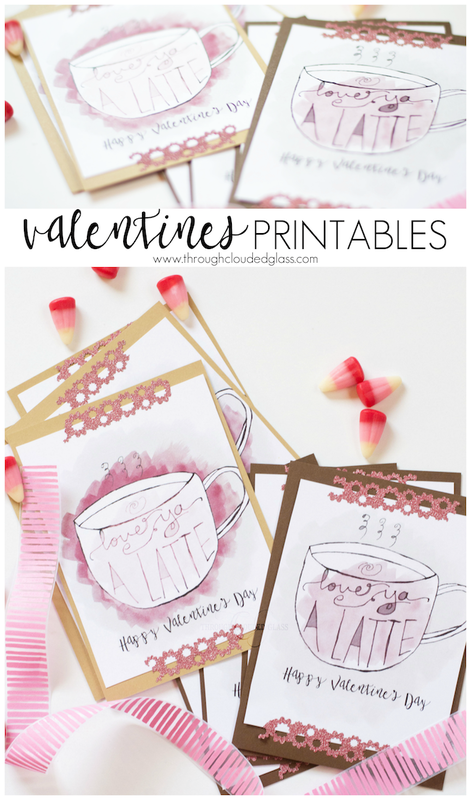 I had so much fun making Valentine's for Wyatt and Gwen's little friends last year, so I decided I wanted to create a Valentine printable again this year, just for fun. This is what I came up with. I drew this little Valentine. The phrase came from a magnet that I have had on my fridge for a long time. I think it's a cute pun. I printed up the graphic, cut it out, and taped it to some card stock using pink, glittery washi tape that I got for a dollar at Walmart. 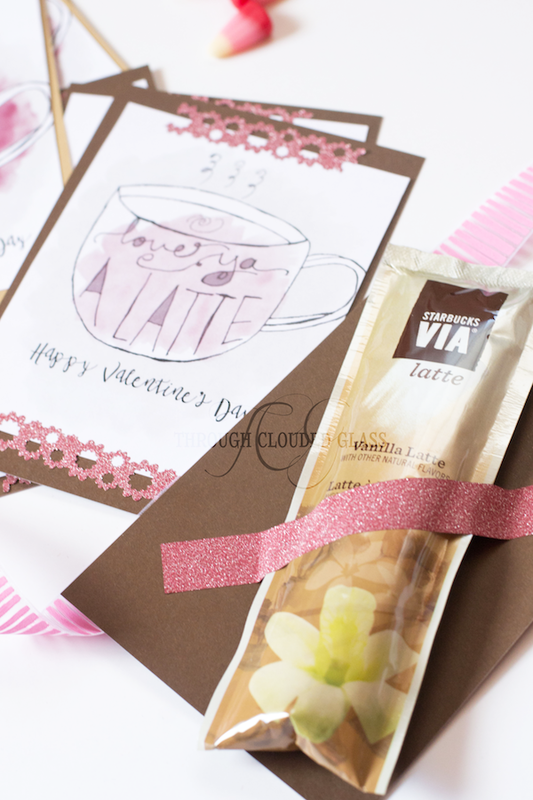 I thought these valentines would be especially cute with a coffee-related gift, so I bought some Starbucks Via packets and taped one to the back of each valentine. 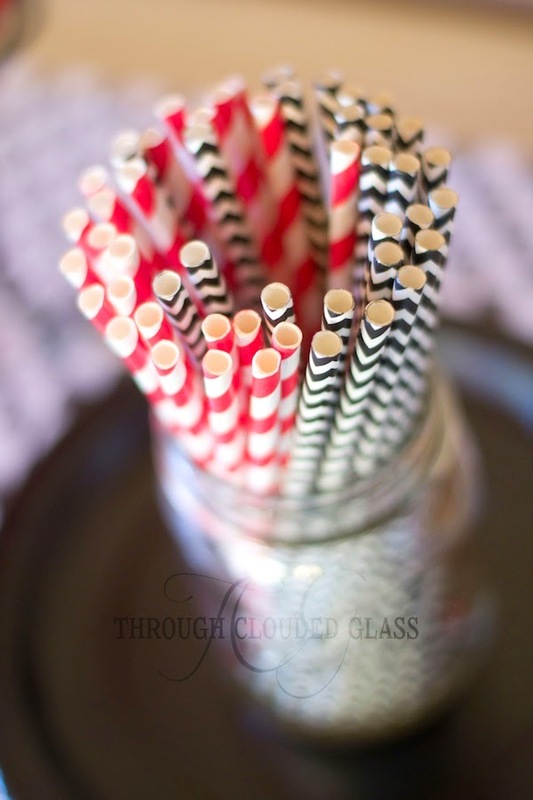 A Starbucks gift card would be great to include with these too. I am planning on giving this to my mom and sister. I might even sneak one into Derek's work bag during Valentine's week, even though we will still do something special to celebrate! 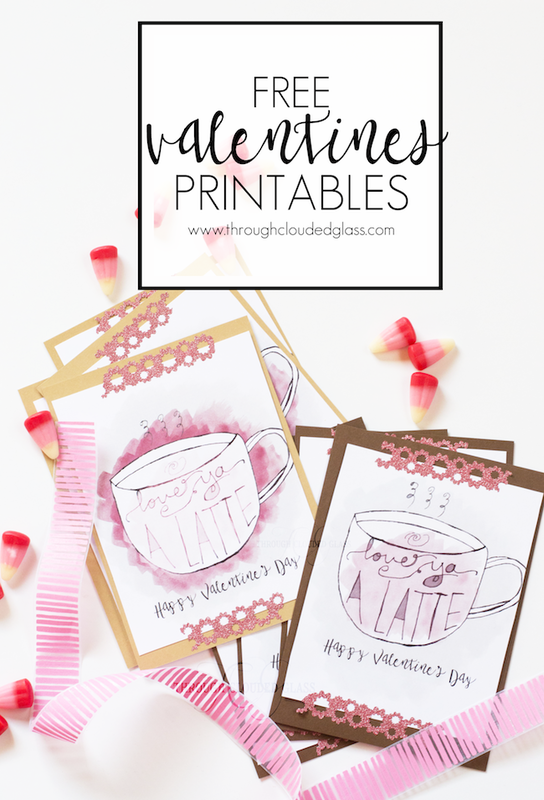 And as a little pre-Valentine's Day gift to my readers, I am giving you these valentine printables for free! 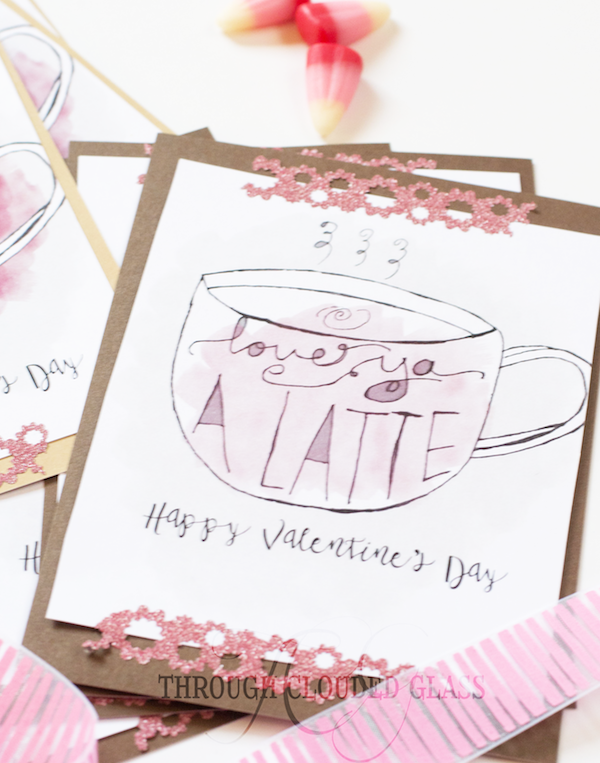 You can download them here (light pink variation) and here (dark pink variation). 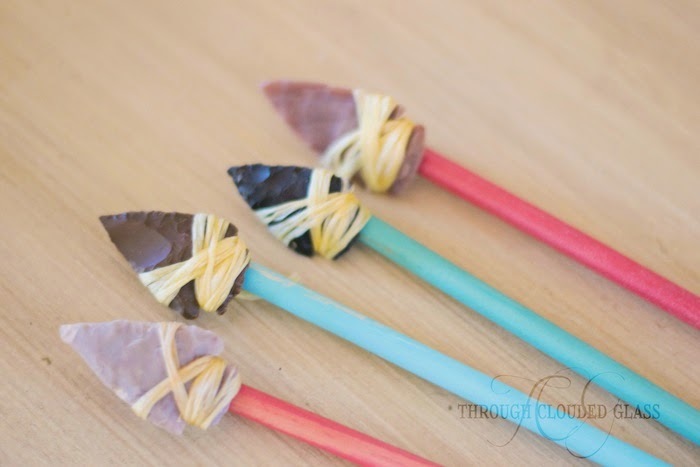 I hope you have fun with them, and if you think of any other creative ways to use them, I'd love to see! 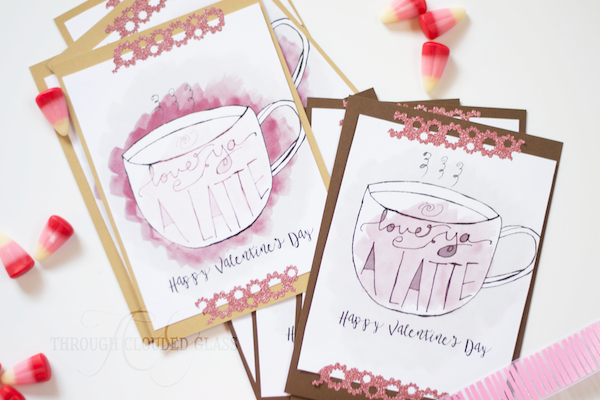 I also thought these would be cute to use for a "I'm thinking about you" card, so my newsletter subscribers will be getting the non-valentine version to use for any occasion! 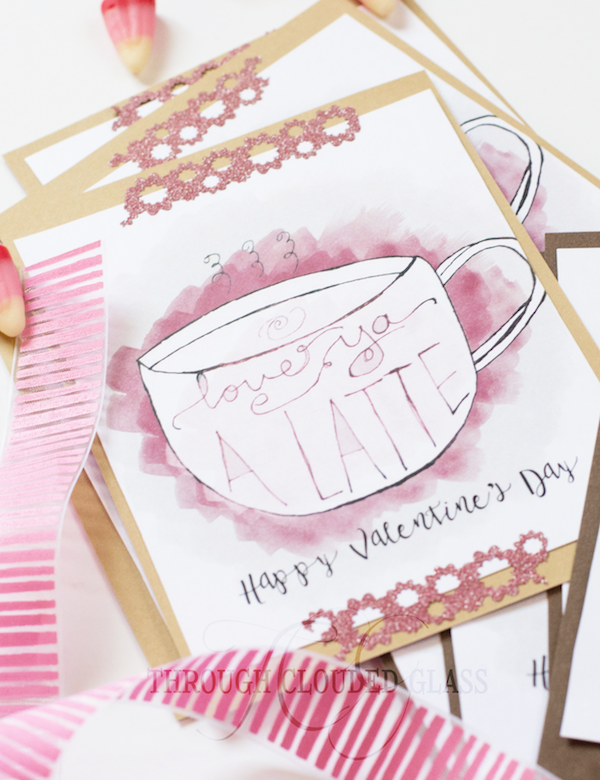 If you would like the non-valentine version, sign up for my newsletter. The February edition is coming out next week, so sign up quick if you would like that version as well!